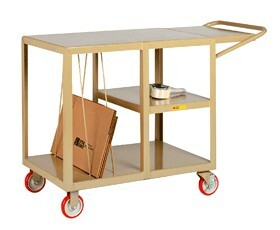 Rugged welded steel cart keeps your packaging supplies in one place. The front section dividers hold and organize KD cartons and other flats. Sturdy 12 gauge top provides a large work area. The extended 12"D x 21"L writing shelf is convenient place for paperwork, or doubles as additional working space. Rolls easily on 2 swivel and 2 rigid 5" x 1-1/4" non-marking polyurethane casters. Lock the swivel caster wheels to prevent unwanted movement. Overall length 52", top shelf 35" high. MPS2436-5PYBK 24" x 36" x 35"	 24" x 18"